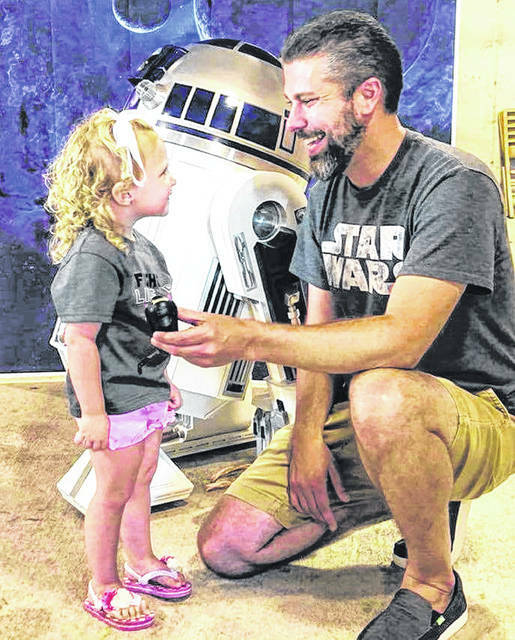 Josh Montgomery introduces a young girl to his recreated “Star Wars” character R2-D2. A unique and special spring musical event featuring selections like “Raiders Throne Room,” “The Imperial March” and “Star Trek through the Years” is coming to Southern State Community College’s annual spring concert. The free concert with an outer space theme will be presented by the Southern State Community Band on Sunday, April 28 at 2 p.m. at the Edward K. Daniels Auditorium on the SSCC Central Campus in Hillsboro, with a special guest appearance of “Star Wars” icon R2-D2. Under the direction of Dr. Brian Siemers, an instructor at the college, the spring concert is the last of this year’s series, but rehearsals will begin again in the fall and the community band always welcomes new members of varying degrees of ability from beginners to professional musicians. Music selections will include themes from science fiction movies and television shows like “Star Wars,” “Star Trek,” “E.T. The Extra-Terrestrial” and “Dr. Who,” plus other musical pieces with a “space-oriented” theme. At a secret lab in the outer rim territories — actually the basement at his home in Greenfield — Montgomery said it took him about 2.5 years to finish up the little R2 series astromech droid affectionately also known to fans as Artoo Deetoo. “I get requests to go around to schools and different places, and obviously Southern State likes to use him for events like this,” he said. He said the droid, which is accurate in every detail, “lives” in his basement and is made of aluminum and steel, stands about four feet tall and weighs nearly 200 pounds. The inspiration for this year’s concert theme came from Montgomery’s creation, and Siemers said the concept isn’t new in that every major symphony orchestra at one time or another performs a space and sci-fi theme. He said since 1998 when the band came into existence, they would always do something related to Veteran’s Day, due in large part to the band’s founder, Corrine Erickson, who was a member of the initial United States Women of the Air Force (WAF) Band in 1951. Erickson enjoyed playing her clarinet decades after she moved to Hillsboro and had the initial idea for the band, Siemers said. She met with Larry Dukes, then president of Southern State, to organize a community band where all members of the community could take part, from Southern State students and alumni to musicians from the area. For information about the concert, Siemers can be reached at bsiemers@sscc.edu.